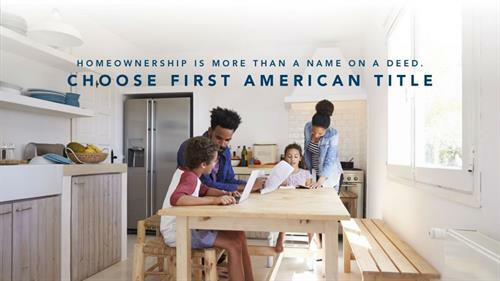 A title insurance policy from First American Title offers protection and peace of mind to homeowners, who can trust that their policy comes from a reputable and financially secure title industry leader. With a nationwide presence that focuses on local expertise, our knowledgeable professionals work diligently to ensure the orderly and efficient transfer of real estate. Every day, across the nation, First American Title is performing closings and delivering information with timeless, accuracy, expertise and integrity - attributes that continue to make a difference in the lives of our valued customers. The people at First American Title are ready to meet your specific needs with a level of service and friendliness that is hard to beat in this industry. When you discover the difference... The choice becomes clear!